Extending to 45 acres in total on the edge of Bantry Bay, the gardens and grounds are a wonderful mix of formal and informal. Arranged over seven levels, highlights include the Italianate garden with its formal yew and box hedging and elevated ancient Wisteria Circle. Rising from this garden is the famed 'Stairway to the Sky' from the top of which there are stunning views over the gardens, House and to the Bay with the Cork/Kerry mountains beyond. On the front lawn are 14 round beds with the House forming an impressive backdrop. Elsewhere in the garden, visitors can stroll up to the walled garden (under restoration) with its ancient apple trees, and, during summer, glorious sunflowers. OPEN: March - October, 10 a.m. - 6 p.m.
Once part of the Bantry House estate, Cashelane Gardens is a 4½ acre garden of mature trees, shrubs, exotic plants, pond, lawns and a beautiful fountain built of local stone. Have an appointment made to have your wedding photographs taken surrounded by the spectacular views of Bantry Bay and the Caha Mountains. If you want peace and tranquillity this is the place to come: bring a picnic and walk down to the sea to enjoy the seals. OPEN: May-September weekdays from 12 - 6 p.m. Week-ends and groups by appointment only. LOCATION: From Glengarriff: Pass the Bay View B&B on your right, continue until pink house on right; turn into road in front of the house. 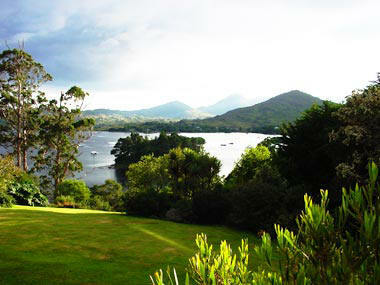 From Bantry: Before you come to Glengarriff Village the entrance is just beside Harrington Hackney and Cab Service. Please park your car on the road. 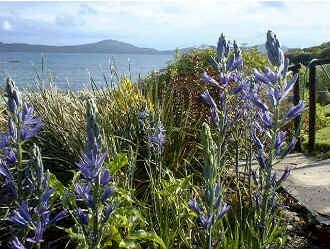 Perhaps the most magical setting a garden could have is to be on an island bathed in the warm waters of the Gulf Stream. 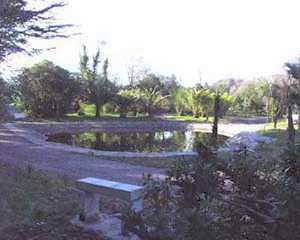 This small island of 15 hectares is known to horticulturists all over the world as an island garden of rare beauty. 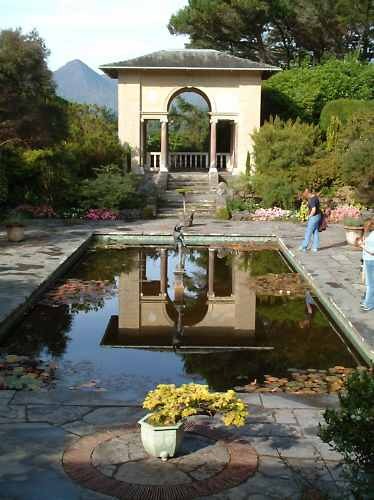 Its centrepiece is an outstanding Italian-style garden designed by Harold Peto, linked by other formal features such as a double sided herbaceous border and surrounded by a wild garden blending into the wider setting of the exceptional sea and mountain scenery around Glengarriff. LOCATION: 1 mile by boat from Glengarriff. Unique in Ireland, the South West's newest exotic garden. 30 different species of Bamboo, 12 different species of Palm trees, huge tree ferns, eucalypts, etc. Superb coastal woodland walks. Unique panoramic sea view. OPEN: Open all year from 9 a.m. - 7 p.m. Dogs welcome. Coffee Shop: Cakes (really homemade). Wedding Photographs by appointment. LOCATION: Glengarriff, just before the village, before the Eccles Hotel. A tranquil and relaxing 2 acre garden, where you can experience peace in an oasis of calm and beauty surrounded by a river and mill stream and accessible only by unique bridges. You can wander round the islands of trees, flowers and shrubs, stroll by the river and enjoy the sights and sounds of the waterfalls or relax in the Portico with Italian-style columns, pond and rippling mill stream. 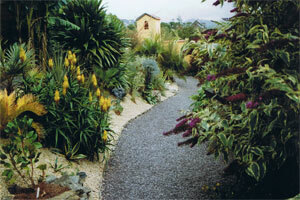 Other features include woodland, wet garden, natural rock garden, etc. OPEN: 1st March - 30th October. Mon - Sat 10 a.m. - 8 p.m. Open Sundays and Bank Holidays by appointment only and open every day (including Sundays) during garden trail (10th-25th June). OPEN: Every day except Monday 10th - 25th June, 12 - 5.30 p.m. and May - September by appointment. Groups at any time by appointment. LOCATION: Just over 1 mile from Durrus on the Kilcrohane road. See sign. This seaside garden is entirely within 30 metres of the sea. 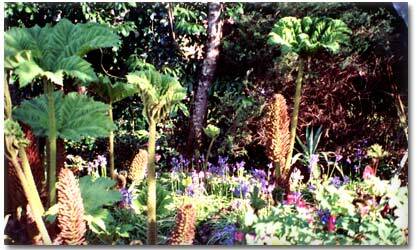 It has extensive south-facing rockeries and the garden has many rare southern hemisphere plants as well as many salt-resistant plants. It has featured in TV programmes such as Gardeners’ World, Flying Gardener and Garden Heaven and in many magazines and newspaper articles. OPEN: 10 a.m-5.30 p.m. during Garden Trail (10th-25th June), except Thursdays. All other times by appointment. LOCATION: From Durrus take right fork to Ahakista. After Ahakista pass castle on left. After 9/10; mile take left turn at sign for garden. Go to seashore. Garden on right.